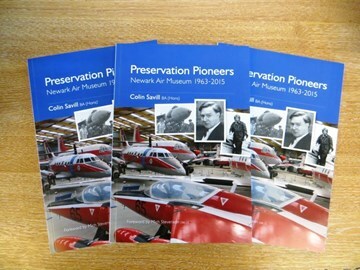 Preservation Pioneers Newark Air Museum 1963 – 2015, is the new book by Colin Savill BA (Hons), which has been published by the Newark Air Museum. (Post & packing for UK Second Class £1.50 per copy; £3.00 if both books are purchased together on the special offer). “Newark Air Museum was one of the very first aviation museums in the UK when it was formed. Located on part of the former WW2 airfield of RAF Winthorpe in Eastern Nottinghamshire the collection of over seventy aircraft and cockpit sections covers the history of aviation. The two aircraft halls house more than 45 aircraft and helicopters and a diverse collection of aero engines and aviation artefacts. An extensive Archive & Library have been gathered together. The first airframe was secured in 1963 and the museum was formally incorporated as a Limited Company and registered as a charity in April and September 1968 respectively. The museum was officially opened to the public on Saturday 14th April 1973.